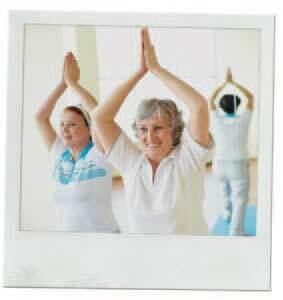 Bonaventure Senior Living uses expert advice to craft a healthy lifestyle for our residents. Experts agree that the key to longevity is practicing a healthy lifestyle. According to the Centers for Disease Control and Prevention, nearly forty percent of deaths in America are related to physical inactivity and poor diet. You can maintain a healthy lifestyle by watching your weight, eating healthfully, staying physically active and taking caution to prevent injury. Senior Fitness is vital to any overall wellness plan, and here at Bonaventure, we incorporate it seamlessly and tailored to your lifestyle. Good health means more than medications, endless forms and doctor appointments. There are no cookie-cutter activities here. Every outing and activity is an idea inspired by our residents. It’s about thriving in all that you do. Bonaventure offers a variety of programs designed to promote physical, mental and spiritual wellness. Physical activity helps you maintain a healthy weight, reduce stress, sleep better and feel better overall. All kinds of physical activity, whether moderate or vigorous, will help you stay healthy. Bonaventure’s fitness centers, with the latest fitness equipment, will help you get started. Even if you have not been active, we will help you start slowly and choose something that fits into your daily life. Bonaventure features activities seven days a week and has up to sixteen to choose from every single day. Are you interested in full-body workouts? How about resistance bands, stretching, meditation, fall prevention, Tai Chi, Yoga or Pilates? You choose what is right for you! Exercise doesn’t have to be strenuous to be good for us. Start a new activity slowly, 5-10 minutes a day and eventually work up to 30 minutes a day. Having a dedicated time devoted to fitness each day can help you sustain motivation, especially if you include a friend or work out with a group. By adopting healthier living practices, senior citizens can maintain a healthy weight, avoid depression and stay mentally sharp. A simplified life: No matter who you are or what your story is, you have had a long life of working hard and caring for others. Let Bonaventure provide you with all of the tools you need to lead a healthy lifestyle in the simplest way possible. Visit today and discover Retirement PerfectedTM.